UDM Downloads > Nemo PDF to Word! 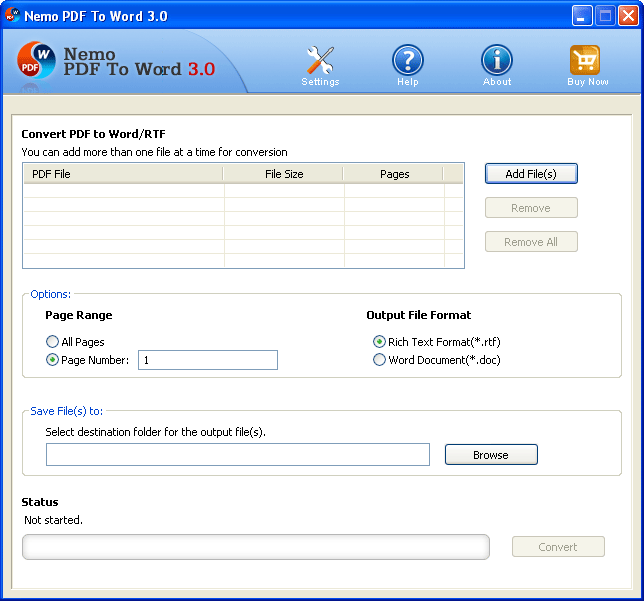 Nemo PDF to Word 3.0 is professional PDF to Word conversion software, working fast and accurately. The converter is powerful enough to convert multiple PDF files by batch conversion and supports partial conversion to convert the selected pages. It is professionally for PDF to Word conversion, serving for PDF to Word conversion solely. The converter works fast, smoothly and steadily. Convert PDF to Word with a super fast speed and with displaying the output files one by one for you. High conversion quality, retaining complete the same of the original PDF file. There's no formatting problem, such as page layout, image positioning and text font, hyperlinks, superscript and subscript, columns, graphics, etc. It supports to convert either an entire PDF to Word or just part of PDF to Word. The converter allows you to define a page number, such as 1, 2, 43, etc. So, if you want to edit only part of the PDF file, you just enter the page numbers will be OK, no bother to convert the entire file. It supports batch conversion to convert PDF to Word, getting high conversion efficiency. You don't have to import the files one by one for the conversion, but import the files simultaneously for the conversion. This is much beneficial if you are dealing with multiple files everyday. It's easy to use software with user-friendly interfaces. On opening the converter, you will see you can finish the conversion job in only one interface instead of repeated settings. 4 conversion modes available to help you set the conversion mode either easier for printing or editing. Allowed to discard the images through conversion and allowed to discard all styles, keeping text only, supports to convert part of the PDF to Word. Standalone PDF to Word converter, no need to have Adobe Acrobat PDF installed, working steady, smooth and fast.